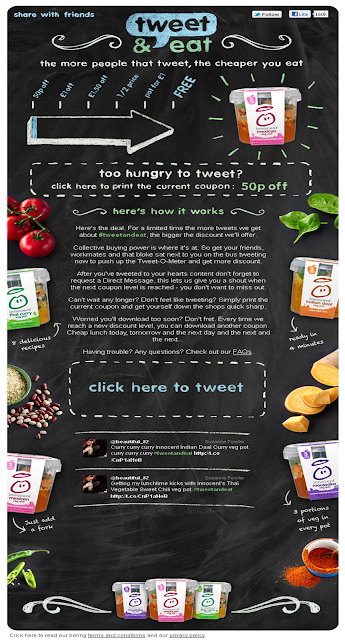 Innocent are running a collaborative couponing campaign for their veg pots. Under the title 'Tweet & Eat' the Innocent veg pots campaign is based around the idea that 'the more people who tweet, the cheaper you eat.' 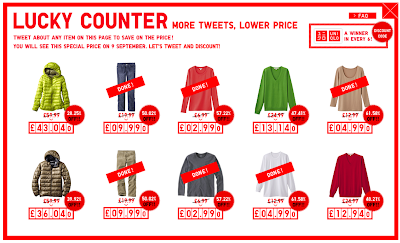 Coupon discount levels will increase over time from 50p off to completely Free. "Collective buying power is where it's at. So get your friends, workmates and that bloke sat next to you on the bus tweeting now to push up the Tweet-O-Meter and get more discount. After you've tweeted to your hearts content don't forget to request a Direct Message, this lets us give you a shout when the next coupon level is reached - you don't want to miss out. Can't wait any longer? Don't feel like tweeting? Simply print the current coupon and get yourself down the shops quick sharp." Clever stuff - the question though is whether this is another example of the collaborative consumption trend that Rachel Botsman writes about at collaborativeconsumption.com or just another coupon / sales gimmick? Innocent Village Fete in Regents Park - a social event in every sense!